BrasaOvens is a secure online shop and we are PayPal certified. 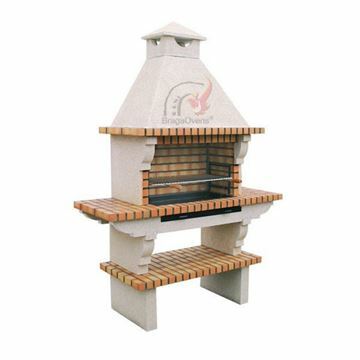 Manufacturers of wood-fired pizza ovens and refractory fire brick barbecues. We ship all our products directly from the factory to your doorstep. it's easy, it's versatile and it's entertainment guaranteed for all your friends and family !! 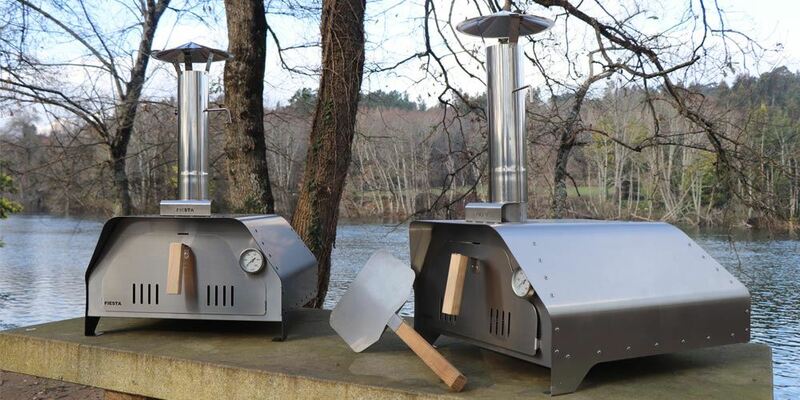 All parts on the pizza oven and pizza peel are made in 304 stainless steel and all handles are oak wood. The oven has (two walls) an outer and an inner wall, both 1,2 mm thick. On the BLACK oven the outer wall is painted in high temperature paint that can stand up to 750ºC, on the SILVER oven, the outer wall is left unpainted, pure plain stainless steel 304. 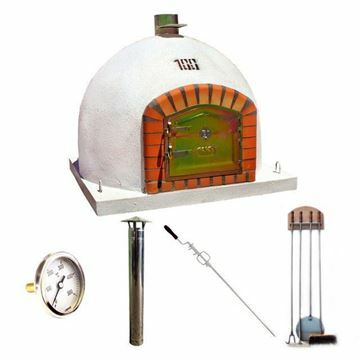 • The easiest pizza oven you'll find! Plug the chimney into place, fit the refractory fire brick into the oven and it's ready to go. • This oven weighs only 22 kgs fully equipped - have it in the garden on a nice sunny day and store it indoors when you're not using it. • Made with double stainless steel walls and a removable refractory fire brick for insulation and heat retention. • It's ideal for a pizza party but it will also roast meat, vegetables, etc ... and bakes a perfect and delicious 12in (30cm) pizza in less than 2 min !! 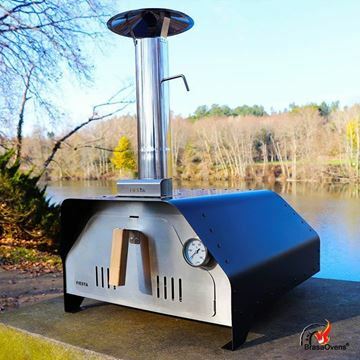 • The easiest portable pizza oven in the market. You just need to plug the chimney into place, fit the refractory fire brick in the oven and it's ready. • This oven weighs only 22 kgs fully equipped. It's very easy to have it in the garden on a nice sunny day and store it inside whenever you're not using it. • Built with double stainless steel walls for insulation and a refractory fire brick to retain the heat. Beautifully built brick BBQ with grill and chimney. It comes complete and ready for DIY in your place of choice. • The BBQ has a removable ash collection tray for easy cleaning. 3 adjustable cooking heights. • Comes with instructions on how to assemble. 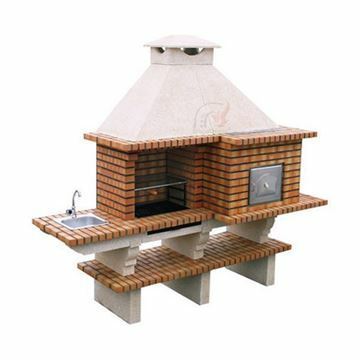 Beautifully built outdoor BBQ with Pizza Oven and Sink. Complete outdoor kitchen with wood fired pizza oven, barbecue grill area and sink ready for DIY. Easy self-assembly! natural stone and it's fully insulated. 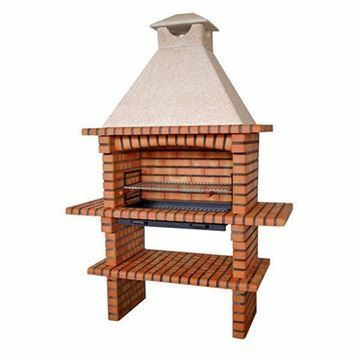 • The CAVERNA outdoor pizza oven is made in natural stone on the outside and refractory fire bricks on the inside. 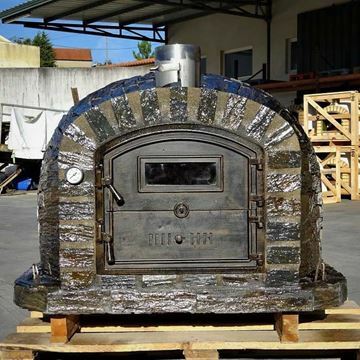 • The oven is shipped in a block inside a wooden crate. There's no assembly required. 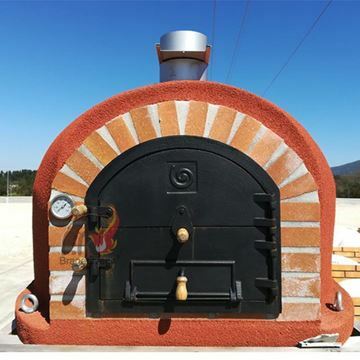 • The pizza oven is handmade in Portugal. It's built in several layers with the highest quality refractory materials. Between the inner and outer layers there's a ceramic blank for optimum insulation. • refractory fire bricks on the inside. • It's 100% handemade in Portugal. It's built in several layers with the highest quality refractory materials. 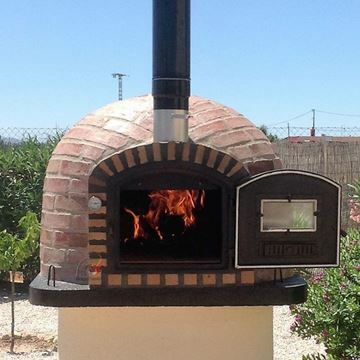 • The REAL outdoor pizza oven is shipped in a block. 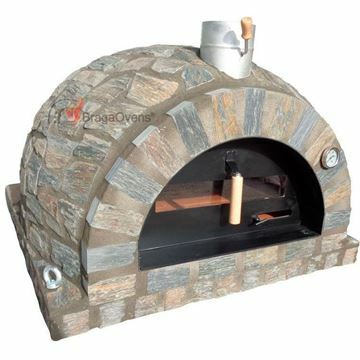 • The pizza oven is made in several layers of refractory clay and ceramic fiber. • Finishing the outdoor oven is a final layer in projected colored cork. The cork gives it extra resistance to the weather elements when installed outdoors and is also another layer of insulation. • The oven is equipped with a cast iron double door 10 mm thick. On sizes 90cm up to 110cm the oven door is 40 x 31 cm, while, on sizes 120cm and 130cm the oven door is 46 x 31 cm. Copyright © 2019 BrasaOvens | www.EN-barbecue.com. All rights reserved.